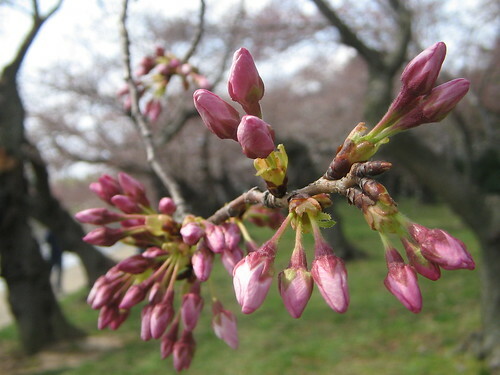 Most of the Yoshino cherry blossoms around the Tidal Basin are still closed buds as of now; looks like it’ll be a few days more before we have a real Yoshino bloom. 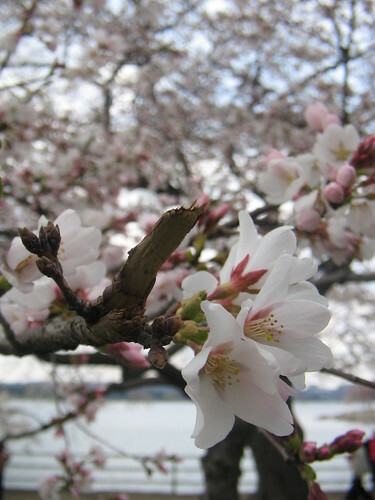 The Shidarezakura trees along the Potomac near the George Mason Memorial are in a much fuller state of bloom now, however. Update: Blossoms, a few days later. Very nice photos but did someone tell you to go fly a kite?? I went to a few of the kite festivals when I lived near Silver Spring; there were some amazing kites there, like the big tetrahedrals that would lift you off the ground if you weren’t careful. Have you gone to any of the Canine Frisbee championships on the Monument grounds? You could get some great pictures there. I remember when I first visited my sister in DC. Spring was just about hitting and the cherry blossoms were exploding. Too bad I was stuck at my sister’s apartment with a severe case of jetlag – my worst episode of jetlag to date.